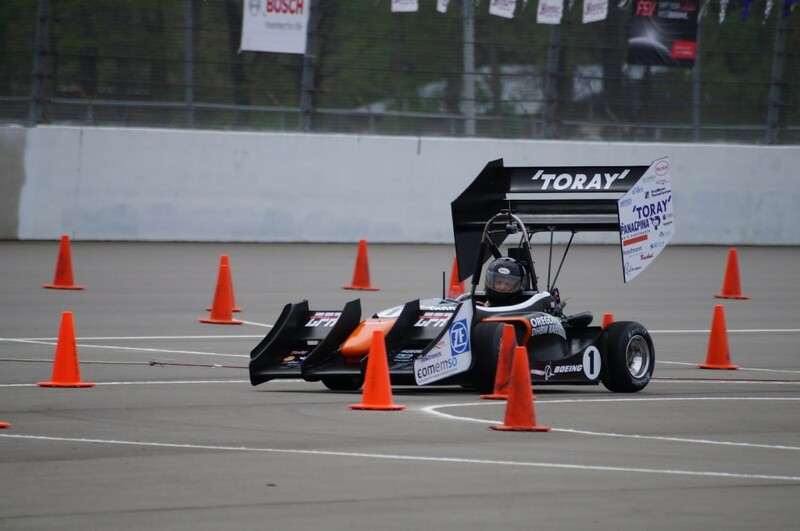 After waiting and preparing for nearly nine months, Global Formula Racing was ready for the 2013 Michigan FSAE event. All the blood, sweat and tears of designing, re-designing, manufacturing and assembly culminating into one amazing racecar and one very synergetic team. The final task standing between us and the actual competition was a 2400 mile drive from Corvallis, OR to the Michigan International Speedway (MIS) in Brooklyn, MI. As the team departed for the 40 hour drive, excitement and anticipation grew. 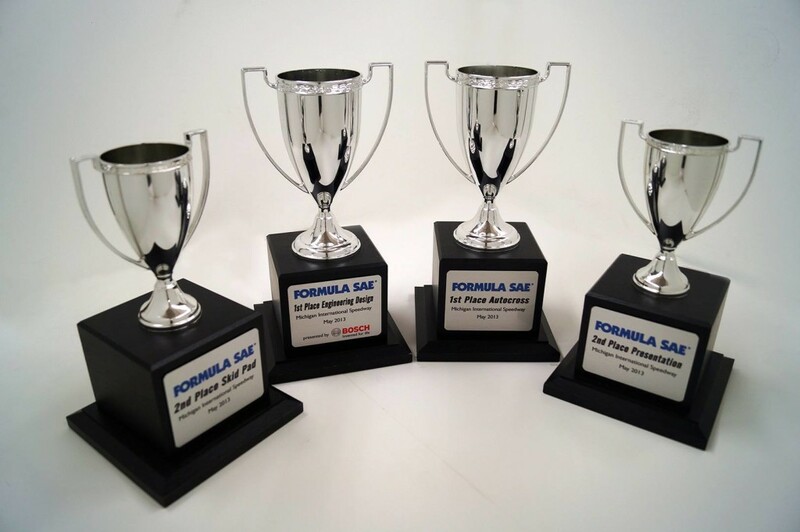 Last year we accomplished something that no other team had done in the history of the competition, winning the Michigan FSAE event for three consecutive years. 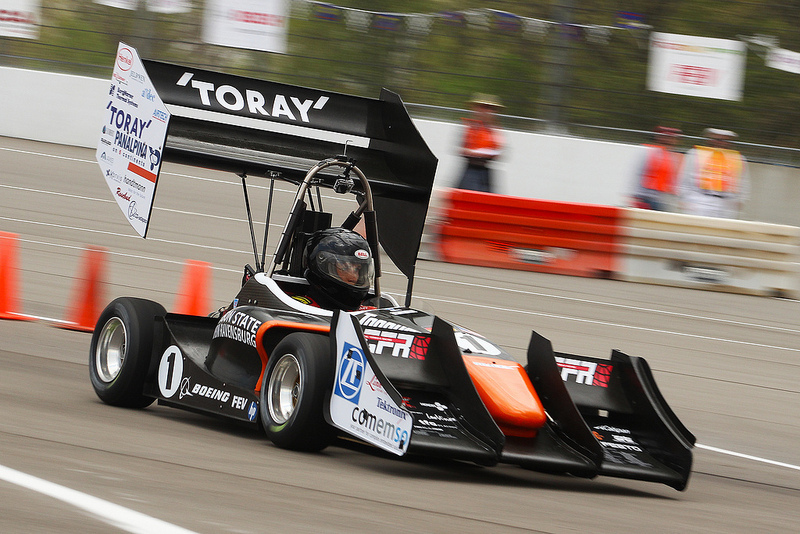 We were again in the pursuit of another record, winning Michigan FSAE for a fourth consecutive year. The team arrived in the evening on Tuesday May 7th with one hour to spare before early registration. After registering, the team then traveled to Graves Farm Campsite just a half mile from the track. ZF annually provides camping trailers for a select number of teams they sponsor. GFR is very privileged and thankful to be one of those teams and are also thankful for Andy, the campsite manager for all the efforts in accommodating the teams. 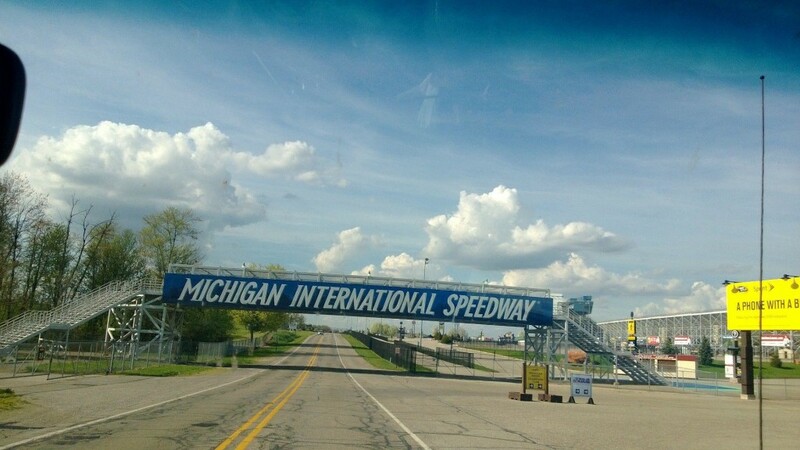 On Wednesday, the team set up our pit in the paddock area located on the infield of MIS. Shortly after we took the car to technical inspection. With minimal setbacks through technical inspection and driver egress, the team was able to finish and pass inspections by the afternoon; giving us time to further prepare for the strenuous static events the following day. Thursday began with the dynamic inspection of the car including the brake and noise tests. With those passed in the first attempt, the team divided into the static presentation groups. All three static events were held on Thursday; including Cost, Business and Design presentations. The overall Cost Presentation result was 81st but scored 17 out of 20 in the real case sub-score showing our ability to react to the judge’s request of theoretically reducing cost on a particular part of the car. Meanwhile, the Business and Design teams gave their respective presentations in the morning and afternoon. By the end of the day the Business and Design presentation teams were notified that they had both been included in the top scoring group of teams. For Design, this means that the team has made it to a further design event including nine other teams for a last round of deliberation and justification on how the car was engineered and why those design choices were made. For the Business Presentation, three finalists were chosen and scored based on the initial presentation made. After completing the initial stages of the static events, Friday included both the finals of the Design Presentation as well as the three dynamic events: Acceleration, Skid Pad and Autocross. By far the busiest day of competition, Friday began with the Acceleration and Skid Pad events in the morning, concluding with Autocross and Design Finals in the afternoon. The team had a great start to the day finishing 2nd overall in Skid Pad and 13th overall in Acceleration. The good news continued when we learned that the Business Presentation team placed 2nd overall and the Design team yet again made another cut-off, officially putting us in the top 3. But we would have to wait for the final results to be announced at the Awards Ceremony after all events were complete Saturday evening. But the next task at hand was the Autocross event where two drivers get two laps each to throw down their best time against the clock. Both the Autocross drivers made complete runs: Ryan Thoma setting the fastest lap of the day even with hitting the same cone on both of his laps and Phil Arscott setting an even more impressive time surpassing the entire field by nearly a full second. At the end of the event, it was clear that GFR had taken first overall in Autocross and had one of the quickest cars at the event. Everything we do as a team comes down to one single event, and that event is Endurance. All the team has done for the past nine months and the first few days of the event leads up to the last day of competition and the all-telling Endurance event. Nothing matters more than starting and finishing Endurance since it is worth 40% of the possible points earned. 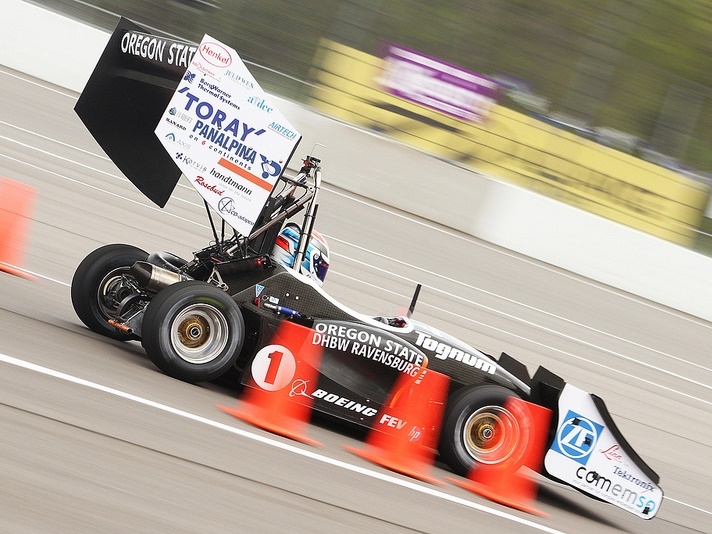 In the history of FSAE Michigan, less than half the teams that start the event do not finish. It is a very stressful but gratifying feeling once completed. As always in Michigan, all the teams were battling the unpredictable weather on Saturday. With an increasing chance of rain as the day progressed, all the teams were anxious to get out on track when they were originally scheduled. Based on times in Autocross, the slower cars are grouped and start the Endurance event first and the fastest cars in Autocross run at the end of the day. For GFR, we would be the very last car out on track because of our first place finish in Autocross. As the afternoon advanced, many teams were looking strong and were able to finish allowing the schedule to proceed on time, until a car leaked oil across the entire track. The race immediately stopped so the track crew could clean the oil as best they could before the remaining eight or so cars began their Endurance attempt. This delayed the event for nearly 90 minutes. While the track was being cleaned, the weather was also changing. The skies were darkening, the wind increasing and temperature dropping; a storm was coming. With just a few cars still to run in the staging line, we decided to change from full slick racing tires to grooved rain tires. With rainfall increasing and official track conditions announced as wet, it was apparent that we had made the correct choice in the face of adverse weather conditions. The teams that were entering the track with non-grooved tires began to struggle in the slippery conditions. Finally, we were the next team to go on track, time to start up and race. Through the delay and changing conditions, the engine had cooled to a difficult temperature for start up and would not fire up immediately. With a few minutes to spare, we pushed the car back out of the staging line and were able to start the car then rolled up to the line again ready to head out on track, however the event staff would not allow the car on track to an irregularity in how we started the car out of the designated area for entering the track. Unfortunately it was decided that GFR was to be disqualified from starting the Endurance event. Our day and participation in the event was over in a matter of minutes. Nine months condensed down to a few precious minutes and ultimately into the moment when we were pulled from the event. It was difficult for everyone on the team to witness and be apart of. 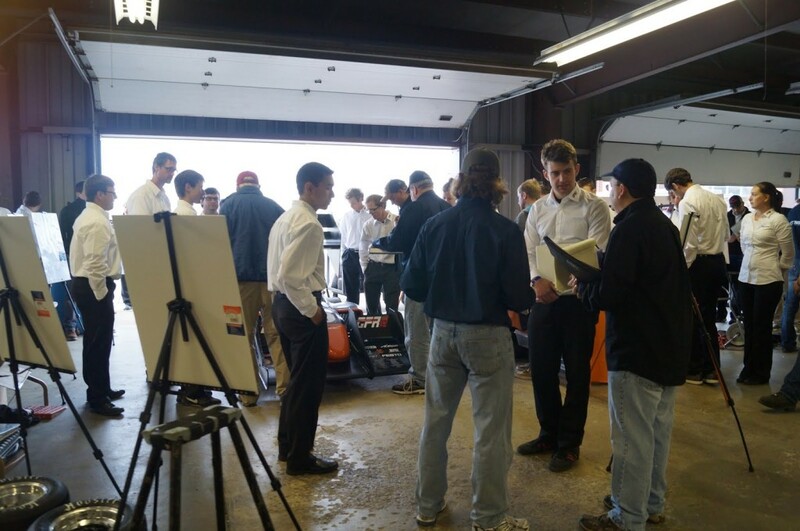 As said many times by various judges and event staff, the experiences we are gaining as students by participating in the SAE competitions are very valuable and give us a leg up on students that are not pursuing prestigious extracurricular activities such as Formula SAE. We know where we can improve and how to do it. We have two months to prepare both the combustion and electric cars for competition in Germany and Austria. We are up for the challenge as we have always been. We look forward to representing all the team’s supporters from Oregon State University to DHBW Ravensburg and our sponsors as we compete as Global Formula Racing in the European Formula Student events. Thank you for your support and interest in the team. Go GFR!